THIS IS NO JOKE! 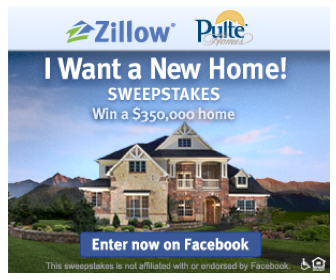 Enter this contest to win a FREE $350,000 new home from Zillow and Pulte. JUST TELL THEM WHY YOU WANT OR NEED A NEW HOME? Seem too good to be true? “Zillow and Pulte Homes, one of America’s largest home builders, have teamed up to give away a brand new, $350,000 Pulte home in the “I Want a New Home” Sweepstakes (i). Head to Zillow’s Facebook page (http://www.facebook.com/Zillow), “like” Zillow, then complete a short entry form for a chance to win (ii). Existing Zillow fans on Facebook are also eligible to enter. Participants interested in doubling their chances of winning may earn one additional sweepstakes entry by visiting a local Pulte Homes community sales center. See Official Rules for details. This promotion is not sponsored, endorsed, or administered by Facebook. (i) The winning sweepstakes entry will be given a choice of a $350,000 credit to purchase a new home in a participating Pulte Homes community or a $350,000 cash option. (ii) Entries valid from legal residents in the contiguous United States. Due to real estate brokerage laws, residents of Michigan, Minnesota, New Jersey and Rhode Island are excluded from the sweepstakes. This contest ended at 11:59pm on November 30th, 2011. I want to win a house,me and my husband has be living in home for twenty years.We have six acres twelve miles from our home.Our dream is having a house build on the six acres.We have a horse and chickens that we have to be there every day to feed them.Winning money or a house would be our dream,and leave our grandkids something of a life time to enjoy. Holle I would like to win a houes for me and my family. Right now I live with my mom and dad and my big boys my husband sleep in the car because he is homeless to L am homeless to because this is not my house is my mom and dad can you please I want to win a prize Home. I want a home . God bless you have a great day. Because me and my animals are now homeless due to the economy and other circumstances beyond my control. The death of a loved one and so on. I am a 32 year old mother of one. I work very hard and help take care of my 37 year old sister that living with a chronic illness. She rhas a daughter that was born uwith a heart disease as well . She had open heart surety at 5 day old in 2003. My sister became ill with her kidney disease in the last year she all so a diabetic with a heart disease a as well am back and forth from my mother house to my sister house house helping cook , clean, shopping, and helping with her dialysis . In need a home for me and my family. Thank you for reading my story about and my family and god bless. It’s the second annual home giveaway!! That’s right, they’re doing it again! You sound like a good candidate Junior, make sure you go to their site and follow the rules to be entered into the sweepstakes. My husband and I have been “homeless” for the past 4 years. We have 3 beautiful little girls God has blessed us with and I really would like a place for us and our 3 girls to be able to call “home”. Im glad my girls are still little and they dorn’t know the struggle my husband and I go through, they don’t really know what’s going on, they just live everyday with a smile on their face. We have 2 achers (that we hope to some day have a home on) with a $200.00 mobile home on it that is not in a livable condition, and we do not have the money or time to fix it good enough to live in. It’s been hard hopping from family memeber to family member and I am greatful that they have been there for us but we could really use our own space and I know they would like to have their space back as well. I am a single mother with two children. I am unemployed but went back to school full time. I would never be able to qualify on my own for a home. We live in a bad area with high crime. Not safe at all. I look out the window to see if my car is ok. I can’t leave the apartment without a family member in the home or else it will get robbed again. I have an alarm system and boultted the door with so many locks. Hope you can help. We really really need it. I’m a mother of one with another on the way. I am currently unemployeed. My husband has a job although it is only a minimum wage job of 7.70/hour. We live in a small apartment complex in our area. The complex is very well known for drugs. My husband who is a RECOVERING drug addict really out of all of us needs more then any thing to be in a different area, concidering we walk out our front door and there is a drug dealer. my husband has been clean for over a year now. we currently live off of welfare assistance (food stamps and medical card) If we had a place of our own we wouldnt need the governement assistance. we both have student loans in default so we wouldnt qualify for any loans to get our own home… nor can we go back to school to get a better job to pull our selfs out of debt. If we had our own home we would also be able to pay those loans back we would be able to live on our own feet and not have to call and ask family members for help when we are low on money, although it is very appriciated I know they dont have much to help either. several of the apartment units have been infested with bed bugs, roaches ect. we are lucky enough to not have any of those issues yet, but that will only last for a matter of time. most of the kids in this area grow up to live the “thug life”, and I worry for my son to grow up here. I can teach my son and guide him to choose to stand out and be different, but in the end its his choice and he will live how he wants to live. I fear if he does grow up here he will join the wrong crowd and get into things i cant prevent him from doing. our apartment has been broken into several times, even though we dont have much! our car is falling apart and soon enough we wont have transportation to take our kids where they need to go. my husband would still be able to get to work because he works about five minuets away. I no we probably dont deserve this home any more then anyone else who has entered for this contest, but I can say we would be so greatful and appriciated if we were picked to win this contest, and would finally be able to begin our lives! I have never had my own place before and I have been working to save up for a place,it is not enough. I have been wanting a place for a long time and it seems like I am not getting anywhere.Thanks. hi . me and my Husband came from Palestine to find peace and the american dream , i really want a baby but my husband said that if we dont have a house we coudnt have a baby to suffer what we suffered in palestine (not save and Move around from house to house) he or she and we need a home , so please make my dream come true.thank you. Hi my name is Amber Beverly and im 14 years old. My parents have been fighting a lot lately and my dad is really mean. My dad is a drinker and my mom has Lupus. Which makes her really sick. She said she wanted to leave my dad but we cant afford it. I just need help. It doesnt have to be anything big. Just me, my little brother and sister are miserable here in Texas. please help! I am seeking ways to obtain getting a free house. I can do the taxes and closing costs. I am on disability, a caregiver, and a very reponsible, positive, stable individual. I am willing to volunteer, work part time to obtain getting a house in a good area of town in northwest, ga. Any condiseration, help, direction, donations would be greatly appreciated. hello, good day madam/sir… i wish to win a house for the very good reason that i want a place to call my home for my whole family. it is hard too hard to live on a place that does not really belong to you. our house is just an infrastructure that can be remove anytime, any moment. that’s all i wish for to have a real home. I am a single grandmother raising 3 grandchildren and supporting my daughter through a full time college degree program.We have never owned our own home and as I seed into the next generation and beyond, I believe owning a home is the best foundation to establish a solid headstart for my children, grandchildren and theirs. I have a fixed income with substandard credit ratings which preclude me from being a qualified buyer.I desire to own a home for the stability of my grandchildren whom I believe have the potential to be greater than what they have been given to deal with. Winning a home for us means winning a future! Your story and many others here are very VERY touching. This specific FREE house contest is over. Follow Zillow and their many sweepstakes as I’m sure this particular one will be run and available again in the future. Thank you so much , I already get your e-mails and enjoy them very much. Also bless you’all for helping someone in need of a home . All my best to you’all. WHY I WANT A HOUSE? SO, I CAN HAVE A PLACE TO LIVE AND THEN TO ACTUALLY OWN MY HOME WOULD BE ANOTHER DREAM COME TRUE ! To not be put out in the street due to divorce at 60 years old. To get back what should of been my children’s inheritance that is being taken away by someone other then family. This would in deed be a blessing for all and for years to come!!!! I would like to be able to keep my family together. I have myself and 2 of my children living with me and my father. My mother and my oldest child live next door, and my sister and her 3 children live with her. We stay so close together to help my mother with my oldest child that has Cerebrel Pelsey and many other medical problems, and to help my youngest sister with her oldest child who has a brittle bone disease. We would rather be living together but we can not find anything big enough for all of us or anyone that is willing to rent one house to 10 people. So we are all living in one apartment complex, but in different apartments. I have been put off work for a year now by my Dr. and I am getting evicted soon! I have health problems, and cervical cancer! I would love to have a new home! I am really in need of a home right now..to where I could own it! I would take it even if it was a small shack! As long as I knew I want going to be on the street! I would be most grateful and happiest! I would like to win a home for my son and I. Going from owning house while married then having to move and start over because divorced . Life change has been hard to recover the stuff lost do to split. Winning a house like this would be a blessing. Thank you! I wish I had a home to give each and every person who has commented here. This contest actually ended a couple years ago, but life goes on and the need still continues along with comments on this post. I wish and pray for everyone commenting that you will find your way, or that your “way” will be rewarded based on your needs and your hearts! Thank you so very much for blessing someone in your life time. That means a lot… to bless someone. I have always said that if God should bless me; I would want to be a blessing to someone else. Passing it on. So whenever you did it.. I say thank you because so many people are selfish with their blessings. You have blessed someone in your lifetime , I say may God continue to bless you . I am a mother of four beautiful kids. I am a single parent leaving off my son ssi check. He was born with spinal biefda. He had surgery when he was a baby. And he lost his hearing also. So i got to stay home and take care of them so i wish i can own my own house so i can i call home. Living with my dad with kids is a problem cause his house it’s not good for my son health. I was reading a lot of the responses , and it seems a lot of people share my same story , which is horrible to know that their are so many single mothers out there god bless, its not an easy road . My electric got shut out a few days ago and my son has ashma.I amworking a part time job as a waitress that I despise , and finally I got back to school. So the difference in my life story is I appreciate my hardships, I diffidently believe it made me , and kids who they are today. Getting this home would be a new start for us. A dream come true. It would give me a boost to my future , and allow my faily a new fresh start . I greatly appreciate tis opportunity , and hope that my family will get to enjoy the comfort of living in such a beautiful home. Really need a new home it will make life a little easier.I am the mother of a cute little girl and very out going and smart. I also take care of my father he has conjested heart failure he would also love a new home that’s why iam entering. Well , one reason I would like to own a home is because I deserve to have a home; and I never owned my own. It’s nothing like owning something for yourself.Yes, I was a single mother raised my two children with the help of God ;though it all it made me stronger.. I struggled ,worked two jobs; and now retired on one job and went back to work and about to retire again on the second. I raised my son to be first a man and my daughter a young respectiful young lady. Durning the devorce my children was only seven and eight years old and everytime I saved money for a house something came along to take the money, But honestly, I use to pray for a home; but I told God that if I could not have a home here on earth ; keep me a home in paradise with him. It will make me happy if I should win but I also know it will make anyone happy who ever wins , so I say to all; I hope its you who are blessed because it will be a blessing to any of us. I say now thank you to all concerns who offers this blessing. May God bless you and yours. Thanks for giving all of us a dream of hope. Hi, I am a 43 year old woman with three children and 1 grand-daughter and I been living with my family all of my life. I’ve never experience living on my own with my children and grand-daughter because no one never told me that one day when I get older that I have to move out one day because I was brought up on “The family that prays together stays together” I guess we never understood that statement until I got older. my story is that I always wonder what it would be like to live in my own house, having the key to my house instead of asking for the key to unlock the front door to someone else home. I know you suppose to be content with what you have and be happy at the same time but how can you be happy in someone else home. I really want to feel that joy of living in my own house one day and all I have is hope and faith that one day God will bless me with that joy that I seek. Thank You. Hello, My husbad and I are getting close to retiring, And need a place to call home. nothing fancy. just a cozy place for two. I am a Pastor with a wife and two beautiful girls. I need a house for my family please.I hope this will help to relax and preach the gospel. Hi. I would love to get my first House. I am a single Mom and i have 3 little kid And they always asking For a home to live And i just want A house a place that we can call home. And no worrys to feel like some body going to kik us from some where that is not my House. Its hurt when i saw my kids asking And worry about if we dont have a House. Help me to get my House please it dosent matter How big just want a place to live And Call home thanyou. Sincerily me And my kids. I would love to have my own house,a place i can call home.and not have to worry about paying for a hotel everyday.this journey of life been really ruff these pass months even though i just had twin boys who passed away this year. This will be a great chance to regroup in get back on track with living,and being happy. this opportunity will be a blessing for me..
My mom is my everything and I’ve been raised by her All my life as a single parent..she did everything for me..winning a home will make her very happy as she has tried all her life 2 buy a house for us but because she is a bread winner at home she can’t afford 2 fulfill her dream all her siblings a depending on her so she always says it’s her biggest fear that when she dies my brother and I won’t have a home!! I ALWAYS WANT MY OWN HOUSE. I AM TIRED OF LIVING ON HUD ALL MY LIFE . A HOUSE IS MY DREAM EVER Y TIME I SEE THE HOUSES AROUND .PLEASE I WIN . Adrenn Clayton http adrennc@gmail . com I am a veteran widow and a daughter of a veteran my husband died in in july 2 2015 my autistic son found his father he has not been able to cope every since we have family on family land in Mcbee south carolina who are willing to help us. I am dealing with cancer off an on along with chronic lupus my mother is now dealing with dementia it really been hard for me living with people who will care for us is the best thing but I need a home to live on the land My son cannot live in a mobile home i have proof of a letter stating this Please this family is in great need of moving to south carolina . thank you for reading my request . Is there a possibility to get a new home if I live in Africa? I’m a single mom with one daughter and we live in a shack, i just want a small house to which my daughter can have her own room. She sleeps with me on one bed and she is starting to get annoyed about our situation and she is only 10. I know u might not be able to help me but I’m taking a chance.